Walnuts contain plenty of nutrients that support good health and kids can benefit from eating them on a regular basis. However, if your child is allergic to any other type of nut be careful when feeding them to her in case she has a reaction. Walnuts are a nutritious addition to cereal, muffins or yogurt, according to the Feeding Kids Newsletter. 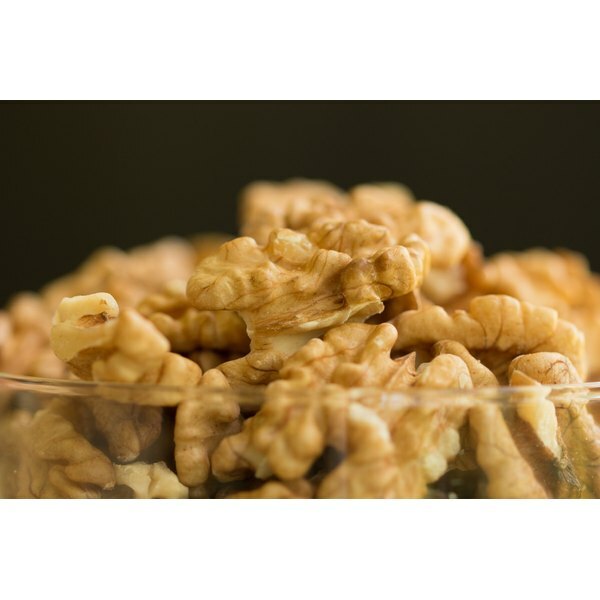 Walnut oil is also available for use in baking or cooking. Walnuts contain fat, but much of it is the kind that is heart healthy. According to the International Tree Nut Council, an ounce of walnuts contains 18g of fat, but 13g of that total is polyunsaturated fat and 2.5g is monounsaturated fat. These types of fat work reduce cholesterol and the risk of developing heart disease, reports MayoClinic.com. Walnuts will protect your child's heart now and down the road. A diet that is too high in calories can result in weight gain, so watch portion sizes when feeding walnuts to your child so that you don't run this risk. An ounce of walnuts contains 190 calories, according to the International Tree Nut Council. One ounce of walnuts is equal to about 14 halves. A serving of walnuts contains 45mg of magnesium, a nutrient that is necessary for children because it helps their nerves and muscles function, aids normal heartbeat, and supplies energy, reports Kids Health. Teens need between 360 and 410mg of magnesium each day so a handful of walnuts will help them reach this total. According to MayoClinic.com, omega-3 fatty acids are important because they reduce heart disease risk and keep blood pressure readings normal. A healthy dose of omega 3s each day will help protect your child's heart now and as he gets older. Walnuts are one of the best sources of omega-3 fatty acids so incorporating them into your child's diet ensures a healthy heart. Omega 3s also contribute to a healthy brain and thus are especially important as children learn and grow. There are several B vitamins, many of which are available in walnuts. According to the International Tree Nut Council, an ounce of walnuts contains 0.1mg of vitamin B1, or thiamin, 0.15mg of vitamin B6, and 28mcg of folate. Children need vitamin B1 because it promotes a healthy heart and nervous system and helps a child's body convert carbohydrates into energy, according to Kids Health. Children need between 1 and 1.2mg of B1 each day. Vitamin B6 is essential for the brain, nerves and red blood cells. Daily requirements for B6 are 1.2 to 1.3mg. Folate, also known as vitamin B9, is necessary for healthy red blood cells and DNA and requirements are 400mcg each day. An ounce of walnuts in your child's daily meal plan will provide a nutritional powerhouse when it comes to B vitamins.